Facial wipes are crucial before and after every workout. Lifting excess dirt and oils off your skin pre-workout allows your skin to breath once you begin. Similarly, cleansing your face post-workout is equally important. Wiping away the sweat that can clog your pores prevents irritation and/or breakouts. 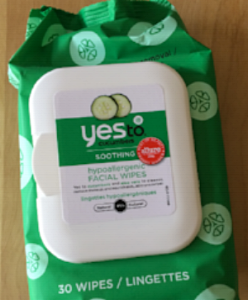 Plus, these specific wipes are hypoallergenic, making them safe for anyone to use. They are infused with cucumber and aloe vera, which are both gentle on the skin and smell amazing! Hair Potion will be your post-workout BFF! It starts out as a lightweight, white powder that transforms into a smooth lotion once worked into the hair. This product creates texture and volume with natural bulking agents, such as kaolin clay and acacia gum. It coats with a matte finish perfect for a "second-day hair" look! Air Control is an innovative, flexible hair spray. It offers strong hold while still allowing hair to move freely and beautifully. It's lightweight, workable hold is derived from natural pine resin, which means it also has a friendly net-zero impact on the environment! This dry shampoo is naturally cultivated in France with oat milk. Oat milk moisturizes, softens, and protects all hair types. It is gentle, and therefore protects the natural balance of the scalp and hair while still working to refresh and clean. This balm works wonders for your lips and skin! It is another hypoallergenic product, making it great for sensitive skin. It can be used to moisturize lips and to sooth rough or dry patches on the body. It can even combat acne- and eczema-prone skin. It's a great all-in-one! This natural deodorant charged with zesty lemon peel oil invigorates the skin, leaving a refreshed, clean feeling while still allowing the body to breath and work naturally. Lemon peel oil not only has a great, citrus scent, but it also has natural disinfectant properties that purify and detoxify. You can still use this spray for a quick spritz of freshness even when you’re not breaking a sweat! These earphones are perfect for a hard workout. They fit snugly in and around the ear to ensure they don't fall out and feel almost weightless as if nothing is there! Sweat and water resistant plus 12 hours of battery life - what’s not to love? Their natural acoustics and enhanced sound quality will definitely help you stay focus and determined to achieve your very best workout!